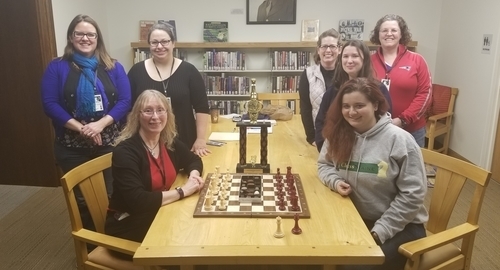 02.04.19 Twenty-five players competed in the first ever Maine Women's Chess Championship and the newly re-established Maine Girls' Championship held on Saturday, February 2nd at the Bangor Public Library in Bangor, Maine. 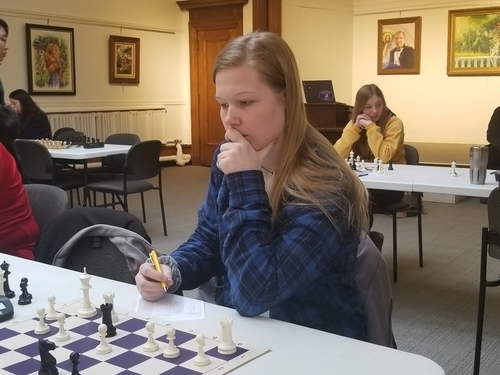 Kathy Richards took the title of Maine Women's Champion with a perfect 3.0 points in three games and Agata Sloniewska, a student at Thornton Academy in Saco, scored 4.0 points in as many games to become the Maine 2019 Maine Girls' Champion. 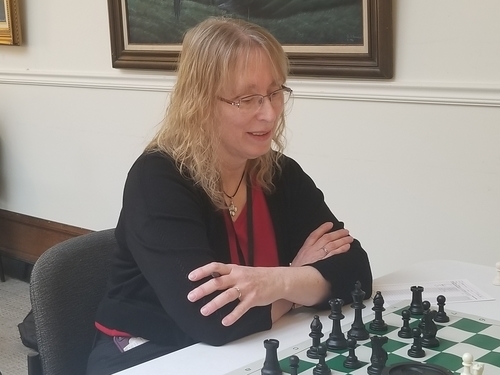 The tournament was attended by 2017 U.S. Women's Champion WGM Sabina Foisor who provided game analysis and coaching. WGM Sabina Foisor (seated right). Thanks to Michael Dudley for contributing to this report. 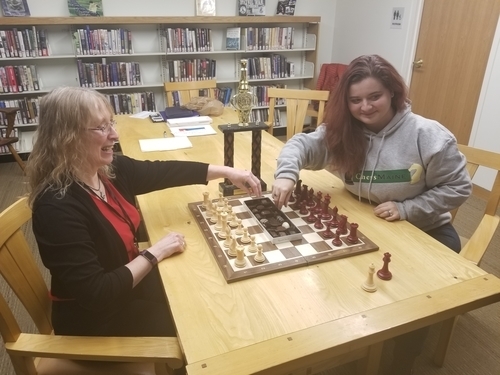 In a ChessMaine.net interview on April 29, 2006, Kathy Richards describes winning the first Maine Girls' Championship trophy in 1972, when George Cunningham offered the prize in response to a lack of female tournament players in the 1971 Maine scholastic championship. 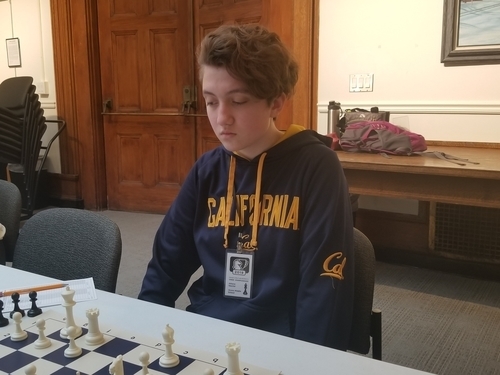 Kathy won that trophy in a blitz playoff after tying with the only other girl in the tournament, named Cheri, both scoring 3.0/5 in the main scholastic section. 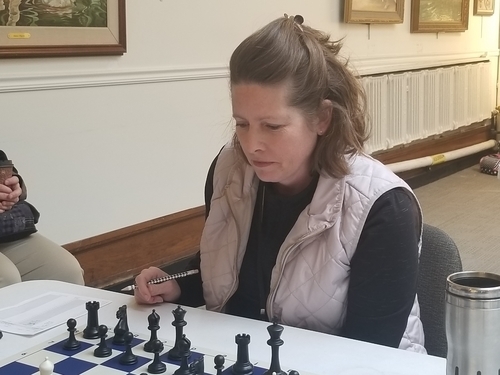 In 2019, 47 years later, Kathy got the chance to come full circle and compete in the inaugural Maine Women's Chess Championship. 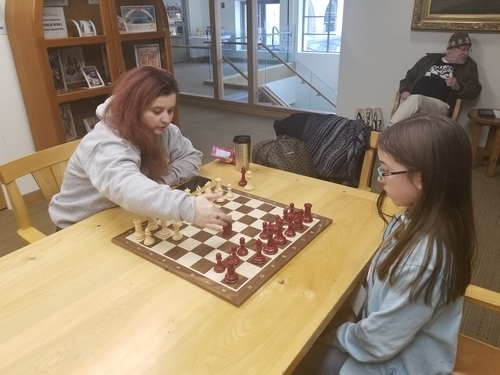 That championship, and the Maine Girls' Chess Championship, was held at the Bangor Public Library in Bangor, Maine, on February 2, 2019, against the backdrop of the biggest surge in chess interest Maine has ever seen. 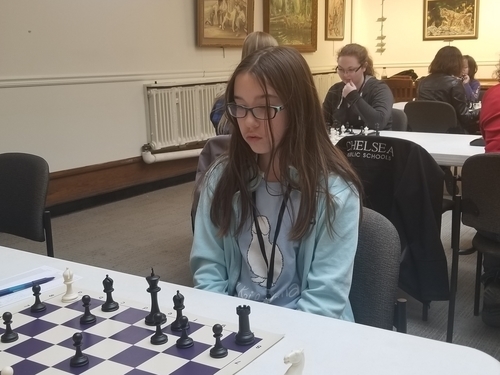 The Girls' Championship offered nominations for the National Girls' Tournament of Champions and the Susan Polgar Invitational, a golden ticket to the most prestigious girls' chess events in the country. 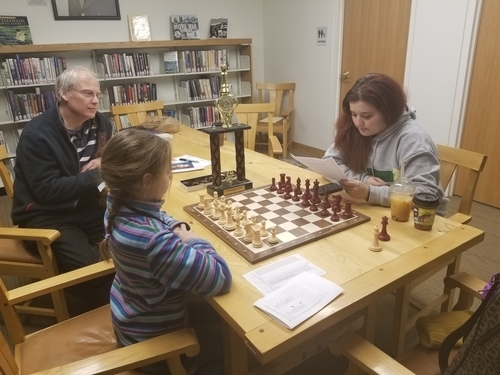 The guest of honor for the weekend was WGM Sabina Foisor, the 2017 US Women's Chess Champion, who visited Bangor to offer a 40-board simul and an exclusive lecture for the event. 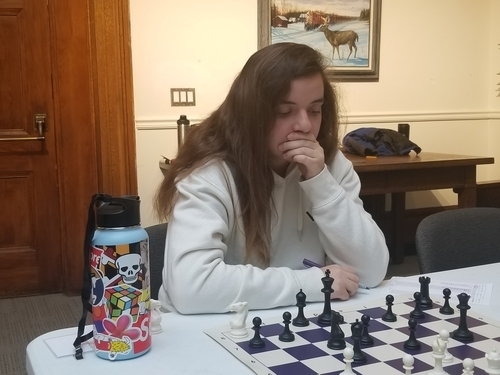 In a spectacular display of mental stamina, Sabina played 39 Maine players for nearly five hours, amassing 33 wins and only suffering two losses and four draws in the event. 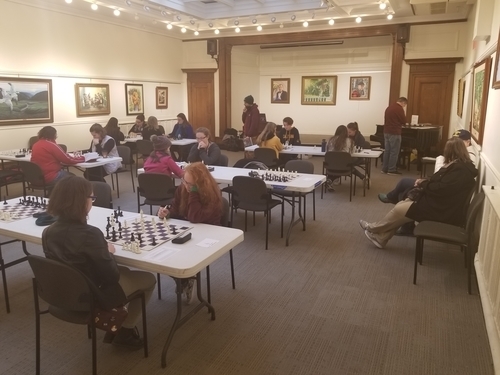 The lecture session, planned for 7:00 p.m. on Friday, February 1st was cancelled and substituted with one-on-one game analysis and coaching the next day at the tournament. 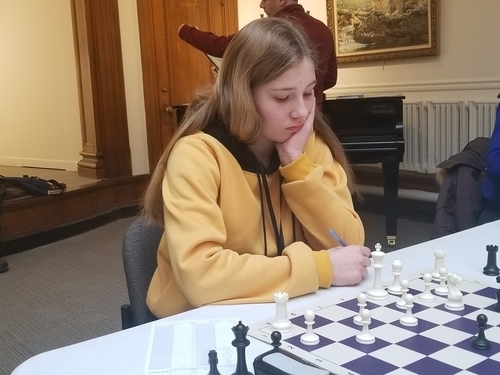 Many of the participants in the Girls' and Women's Championships called it a night to get rest for the next morning yet, the female participants in the simul showed promise, some playing into the late hours of the simul and holding even positions for several moves. This marked the multi-section chief TD debut of Linh Nguyen, Maine's 2017 representative to the National Girls' Tournament of Champions and a John Bapst alum. 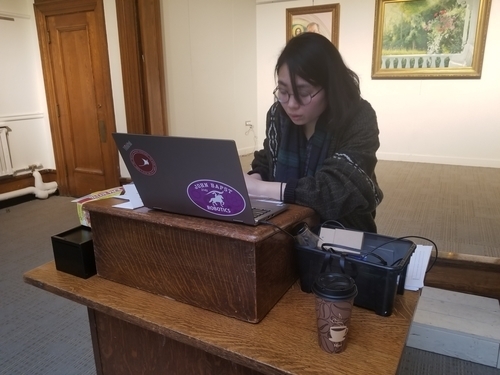 Currently a student at Mount Holyoke College in Massachusetts, Linh is a new tournament director with loads of potential, as she has founded Mount Holyoke's first official chess club and has ambitions to play and work on the national stage. 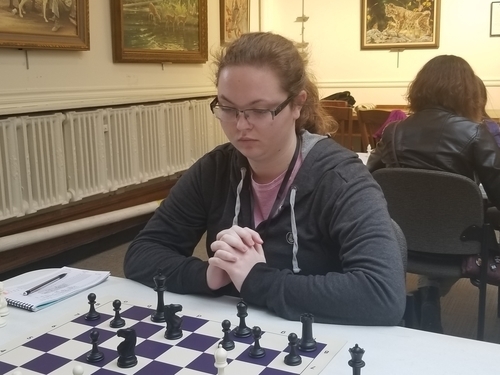 In the Women's Championship, Kathy Richards hoisted the crown and became the first Maine Women's Chess Champion, followed closely by Anna Thomas (2.0/3). 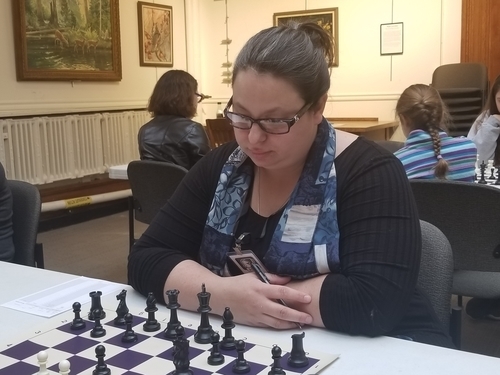 Sharon Klein and Shannon Levesque tied for third with 1.5 points out of three rounds. 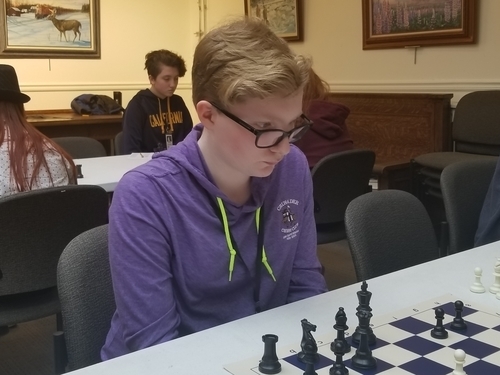 Karen Hendrix went 1.0/3 in her tournament debut, and Elisabeth Mock rounded out the crosstable in sixth. 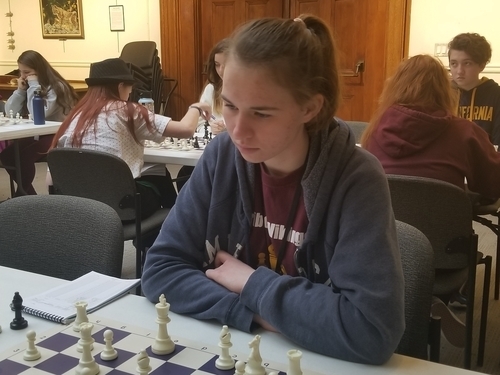 The Girls' Championship ended in a fourth-round matchup between the two clear favorites in the field: Agata Sloniewska from Thornton Academy and Hailey Holmquist from Caribou High School battled it out in the fourth round both having perfect records. 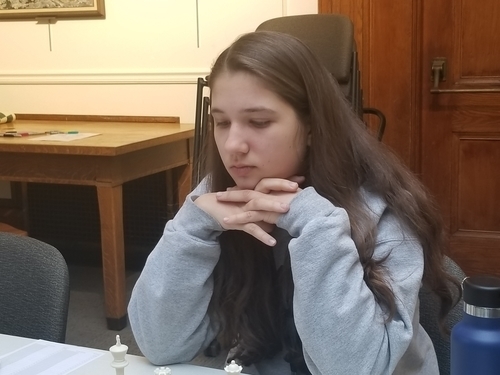 In the end, Sloniewska swept the field for clear first, earning the right of first refusal to represent Maine on the national stage. 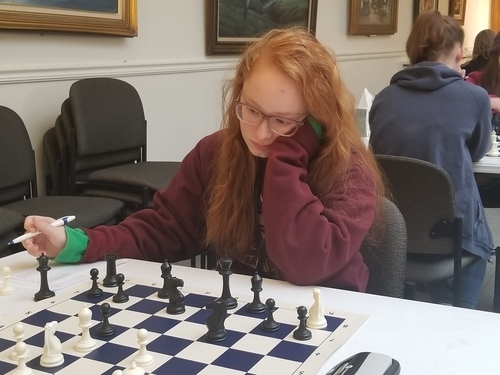 Behind her, Holmquist, Zoe Dinnerstein (Cape Elizabeth), Clara Parker (Cape Elizabeth), Tala Bayless, and Grace Gallagher (Caribou High School) all finished tied for second. 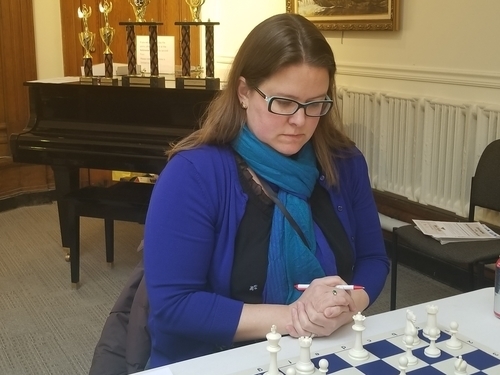 Holmquist and Dinnerstein took second and third on tiebreaks. 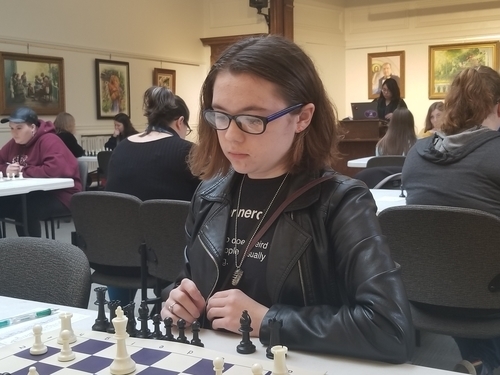 Athena Saucier (Orono Middle School), Ebba Hidestrand (Stillwater Montessori School), Emily Jones (Bonny Eagle Middle School), Bridget Frazier (All Saints Catholic School), and Sarah Richards finished tied for seventh place with 2.0 points. 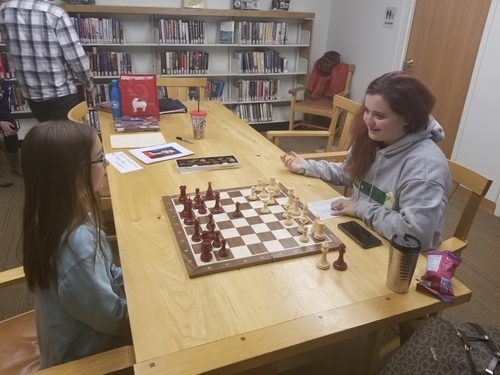 Brooke Laplant (John Bapst Memorial High School), Olivia Montoya (Thornton Academy), Emily Wotton (Medomak Valley High School), and Amanda Bustard (John Bapst Memorial High School) followed with 1.0 points, and Porter Hubbard (John Bapst) and Frances Bayless rounded out the crosstable with 0.5 point. 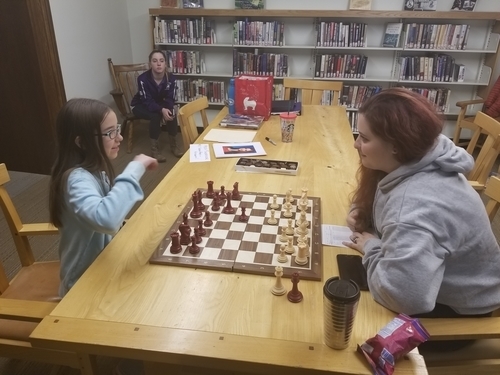 It was an amazing day for girls' and women's chess in Maine, and inspiring to see on all fronts. 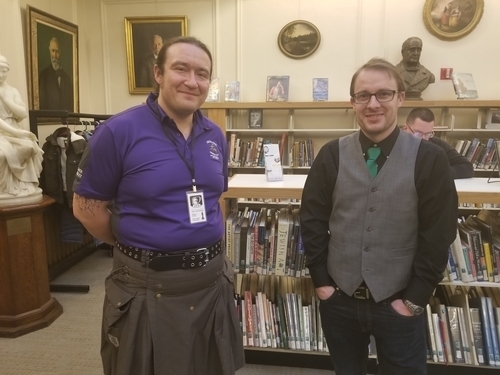 Thank you so much to all who attended. 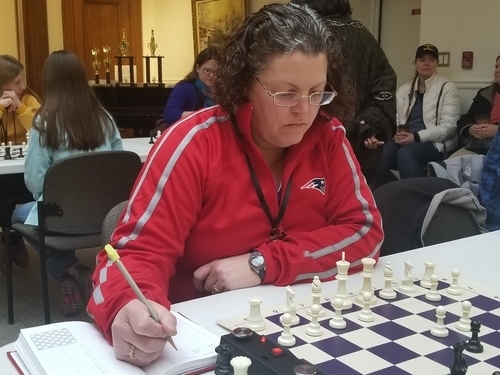 Congratulations to the 2019 Maine Women's Chess Champion Kathy Richards! 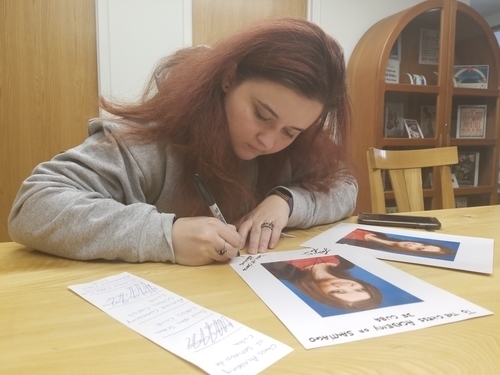 Anna Thomas scored 2.0 points for second place and the Runner-Up position. 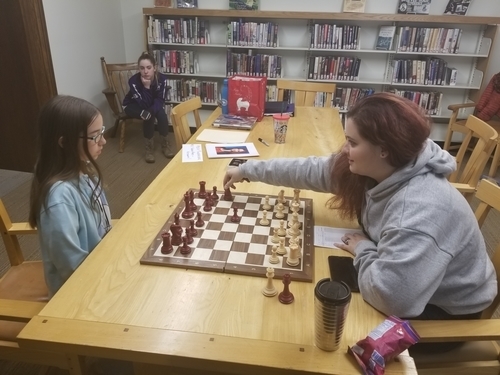 Maine Chess Association Treasurer Shannon Levesque. 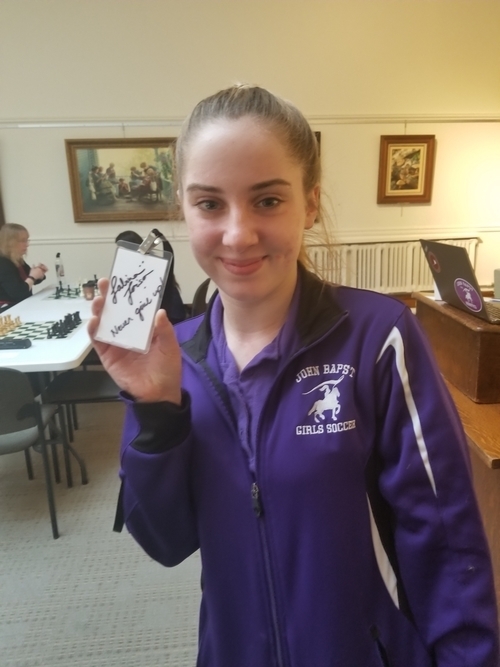 Amanda Bustard shows off her official 2019 Maine Girls' Chess Championship nametag signed by WGM Sabina Foisor. 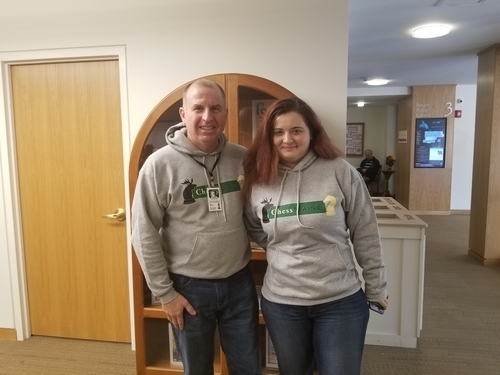 WGM Sabina Foisor cashed in on some coveted ChessMaine swag. and for game analysis and coaching. 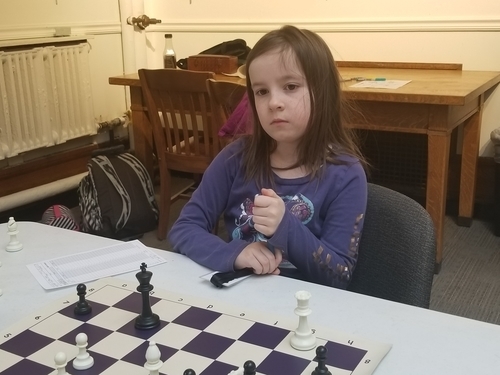 Stillwater Montessori School student Ebba Hidestrand was lucky enough to get an interview with the Women's Grandmaster. 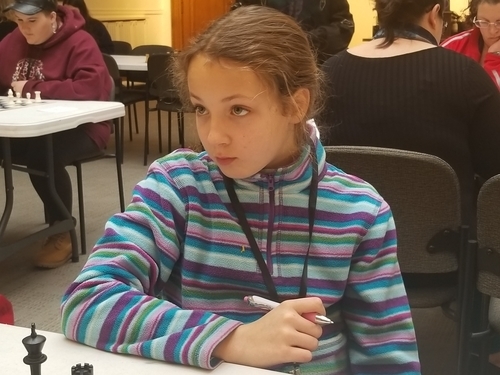 The student listened attentively accross the board from the master. Chocolate caramel to e4! 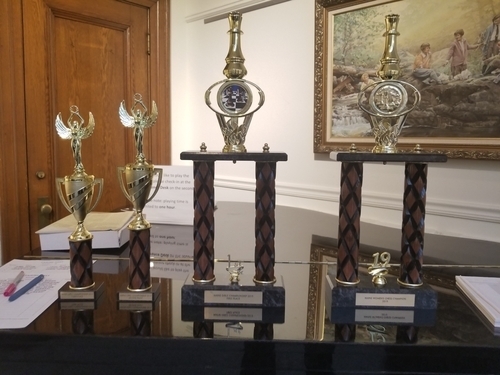 Thanks to all who made this memorable event a great success and a hearty congratulations to all the players! Gratifying to see such a well attended event after a long hiatus . What a pleasure to see the name and a photo of Kathy Richards once again. 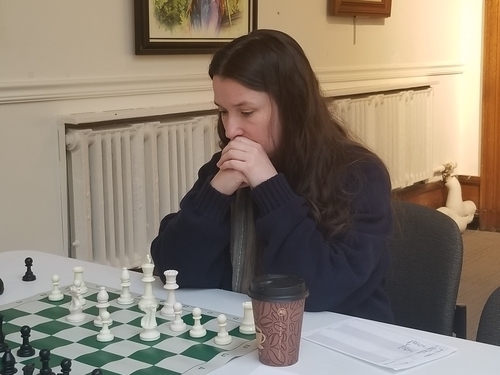 It's been years since I had heard of or seen her and it is a pleasure to know she is still playing chess and has reached the Maine Championship. I would have still recognized her and so she has not changed!! Congrats to Kathy. Back when I lived in Maine, there was a 1900-rated woman player named April Yergin, who moved away. I was a master in those days, and she was tough to beat.